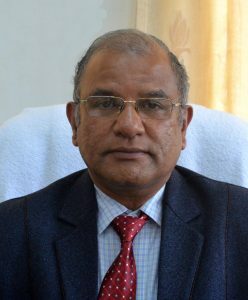 Professor Parmendra Prasad Dabral joined as Dean , College of Agricultural Engineering and Post Harvest Technology on 28-12-2017. Professor Dabral obtained his B.Tech. ( Hons.) From GBPUA&T, Panatangar and M. TECH and Ph. D from IIT, Kharaghpur( W. B.). His area of specialisation is Soil and Water Conservation Engineering. Prior joining to CAEPHT, Ranipool he served BAU, Kanke Ranch from 1990 to 1997 as Assistant Professor. He also served as Associate Professor and Professor from 1997 to 2017 at North Eastern Regional Institute of Science and Technology (NERIST), Nirjuli (Itanagar), Arunachal Pradesh. At NERIST he served as Head ( Agricultural Engineering Department), Coordinator(CEP), Professor incharge Training and Placement, Chief Vigilance Officer, Dean (Administration) incharge and Dean( Academic). He is life members of 06 professional societies. He is Fellow of Institution of Engineers (India), Indian Water Resources Society, Indian Association of Hydrologist and International Society for Conservation of Natural Resources. He has guided 20 B. Tech. and 10 M. Tech. Projects. He has also guided 03 Ph. D. Students. He has Published 19 research papers in the International journals and 40 research papers in the national journals. He has also edited two books.